I hope you've had a wonderful week. 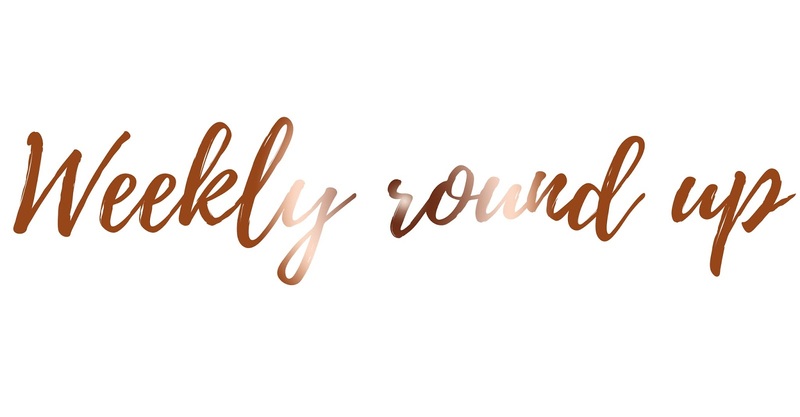 It's the first weekly round up of April, even though we're only two days into the month! However, I am pleased to say it's finally half term and I cannot wait to do absolutely nothing for three weeks. Although I did have 2,000 words to write up to finish one of my essays ready for submission on the 24th! Another exciting thing which happened this week is I'm finally into my new job! Many of you who regularly read my blog know I worked as a learning support assistant with a boy who has ADHD. However, I'm now working with a boy in his class who has Autism instead. I'm looking forward to the new adventure and learning a heck load new things! Hopefully working with a different child I'll be a lot happier too; who knows. So as it's a new month I plan to spend today having a spring clean and thinking about whether or not I'll use half the stuff that's in my bedroom. I have so much stuff in my wardrobe and underneath my bed which I never touch and probably haven't touched in over a year. So my plan is to just throw it away; even if I wanted to keep it as truthfully, I won't ever use it or wear it again. I also got a new piercing yesterday! I'm planning on having the triple forward helix but for the first couple of weeks I only have one of them pierced for now. There's pictures over on my Instagram story, snapchat and twitter if you want to have a look (@kimberleyjessca). I'm really interested to know what everyone has planned for the half term. Do you have the Easter break off or are you still studying or working?